So, Stardust goes ahead and scoops up a whole whack o' kids without informing their parents or schools, gives them his powers (without, apparently, depleting his own) and drops them right into combat without any training. Okey dokey. Almost as unsettling as that is Stardust actually kind of smiling and telling the kids he's proud of them. Who knew he was capable of something approaching warmth? As with Stardust's sort-of romantic partner in an earlier story, I suspect this one came about by editorial dictate. 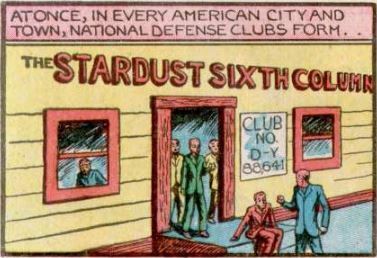 By this point child sidekicks for superheroes were a thing, so I can imagine the editor wanted Stardust to have one too. Only Hanks, being Hanks and having to go over the top with everything, presumably thought, "A sidekick, phooey. I'll give him a whole army of sidekicks!" Let's toss in "he tells the kids exactly what to do and they just do what he would do anyway, while he's there." He doesn't, technically speaking, need them for *anything*. You can tell that Robin and the Marvel Family were big hits at this point, but one big difference between the Marvel Family and the Sixth Column is the Marvel Family got *names*! I like how it's to some extent *relatively* grounded in the politics of the day: Fifth Column, aggressor nations "In Europe and Asia", and then they ally with martian Sky Demons who hurl disintegrating super-bombs. And Stardust instantly determines that they mean the Sky Demons, rather than another country. The Sky Demons get off pretty light, they get to just turn around and go home! Hey, if I was coming to invade a world and I saw Stardust the Super Wizard waiting for me I'd just keep right on driving. Probably roll up the windows for safety too just to be careful. Oh yes, it's just sensible! So none of the bad guys would have their minds wander just before Stardust would read their thoughts?